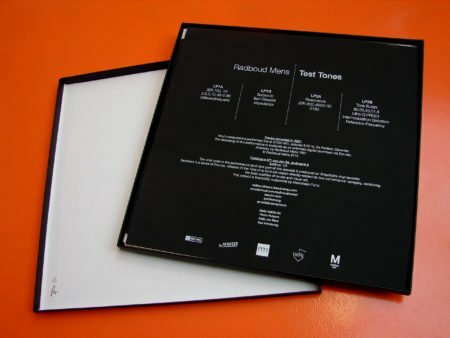 Radboud Mens – Test Tones | Esc.rec. Available formats: Two manipulated 12″ vinyl records and three artworks (in a limited edition of one) and/or an unlimited digital download. Radboud Mens was invited by record label Esc.rec. to make a release in the Sediment series, with appurtenant live performance in mini-venue De Perifeer. Sediment is a series of Esc.rec. releases in a ‘one-of-a-kind-art-object-directly-related-to-live-performance’ category, combining the best qualities of music and visual art. 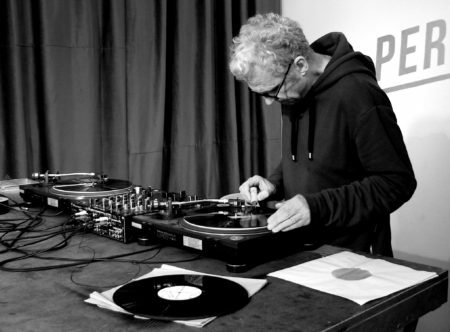 In 1994, Radboud Mens gave his first noise performance in De Melkweg, Amsterdam. It was an evening in honor of the 50th anniversary of publisher De Bezige Bij. The evening was curated by a lady who had heard through the grapevine that there was a dangerous lunatic out there who destroyed records with a dog brush. It’s like John Cage already said: records are not music, but objects that can be used just like any other instrument to make music. Besides Hyware (the name of this dog brush noise project), Mens had a rhythmic noise project called Technoise. 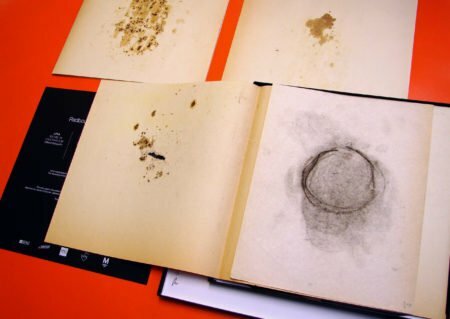 The idea for this project was also based on the use of records. A little later he was creating rhythms with vinyl tics and crackles, by manipulating blank vinyl with box cutters. The derived recordings were automatically set in locked groove speed; 4 beats in one revolution, or 133 1/3 BPM.  This led to minimal techno, which was released on vinyl by AudioNL and other labels (and also featured in several Esc.rec. compilations). In 2001 Radboud Mens made music with test-tone records by playing them through a delay that was set in a locked groove tempo. 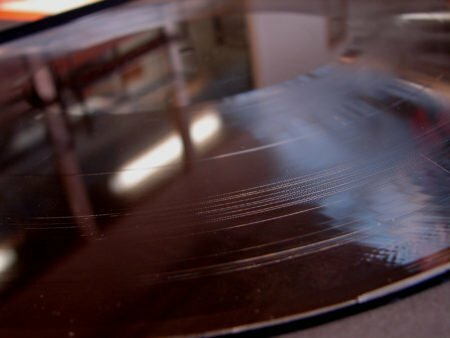 This causes all the crackles in the records to overlap, creating a rhythm. These tracks have been gathering dust for 15 years; never released, never used. Unfinished. At the invitation to participate in Esc.rec.’s Sediment series, the idea to use these tracks surfaced immediately. Test Tones! Destroyed! 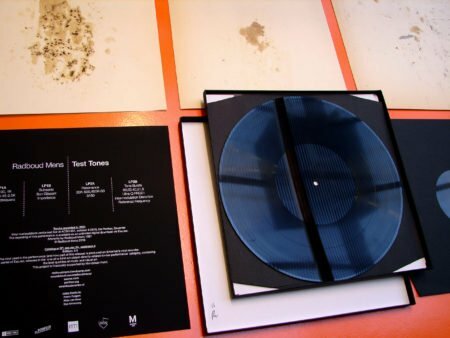 The Sediment release by Radboud Mens is titled ‘Test Tones’ and consists of one(!) unique signed and numbered box with two freshly cut vinyl records, which were manipulated/mutilated live in concert. The box also includes three artworks by Radboud Mens, an inlay and a poster. Recordings of this concert are available as an unlimited download. This download includes 18 photo’s of the live performance and the extensive artwork of the pysical release ánd a special bonus track; a live recording of manipulated AudioNL minimal techno records by Radboud Mens.